Identity marketing is a promotional strategy that encourages consumers to alter some part of their bodies to advertise for a branded product. Air New Zealand created “cranial billboards” in exchange for a round-trip ticket to New Zealand—30 Los Angeles participants shaved their heads and walked around with an ad for the airline on their skulls. 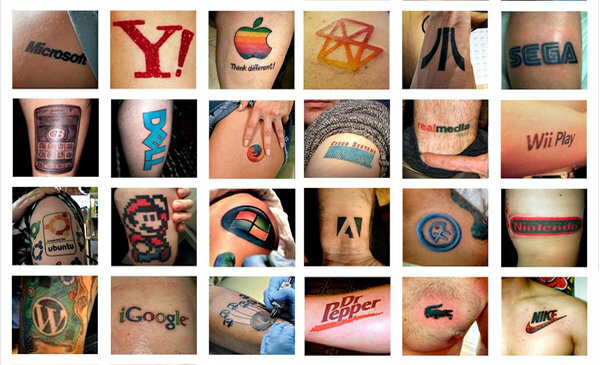 Temporary tattoos of brand logos are common these days (along with a fair amount of the permanent ones pictured above). Companies hand them out like candy at sporting events, concerts and other public venues. This idea is hardly new; bubble gum companies in the 19th century distributed crudely made versions of today’s temporary tats, and then in 1890 Cracker Jack included them as one of their “prize in every box” promotions. But today the stakes are bigger: Reebok set up a pop-up tattoo shop at an event in Sweden and gave away thousands of dollars in prizes to the fan who got the biggest version of the brands’ new triangle logo (not a temporary one). The lucky winner’s right thigh is, shall we say, Reebok’s for life. One study found that people commonly view their shoes as magical emblems of the self; Cinderella-like vehicles for self-transformation. A common theme that emerged was that a pair of shoes the person obtained when younger—whether a first pair of leather shoes, a first pair of high heels, or a first pair of cowboy boots—had a big impact even later in life. These experiences were similar to those we see in such well-known fairy tales and stories as Dorothy’s red shoes in The Wizard of Oz, Karen’s magical red shoes in Hans Christian Anderson’s The Red Shoes, and Cinderella’s glass slippers. In addition to shoes, of course, many material objects—ranging from personal possessions and pets to national monuments or landmarks—help to form a person’s identity. Just about everyone can name a valued possession that has a lot of the self “wrapped up” in it, whether it is a beloved photograph, a trophy, an old shirt, a car, or a cat. Indeed, usually we can construct a pretty accurate “biography” of someone when we simply catalog the items he displays in his bedroom or office. A study illustrates that the product’s relationship to the owner doesn’t even have to be that strong to influence a consumer’s self-concept. In one experiment, researchers approached women in a shopping mall and gave them one of two shopping bags to walk around with for an hour. Women who received a bag from Victoria’s Secret later reported to the researchers that they felt more sensual and glamorous than those who were given a more mundane bag. In another experiment, MBA students were asked to take notes for 6 weeks using a pen embossed with the MIT logo; they reported feeling smarter at the end of the term. Those external objects that we consider a part of us constitute the extended self. In some cultures, people literally incorporate objects into the self: They lick new possessions, take the names of conquered enemies (or in some cases eat them), or bury the dead with their possessions. According to the American Society for Aesthetic Plastic Surgery, Americans get more than nine million cosmetic surgical and nonsurgical procedures in a year. The most frequently performed surgical procedure is breast augmentation, which typically involves the integration of man-made silicon implants with the patient’s organic material. More than four million Americans have an artificial knee. At least prior to his arrest for murder that made global headlines, the South African track star Oscar Pistorious competed against world-class runners with two artificial legs made of carbon – his nickname was “Blade Runner.” Nike teamed with orthopedics company Össur to introduce its first sprinting prosthesis, called the Nike Sole, perhaps the first commercially scalable transformation of disabled athletes into “superabled” athletes. 1. Individual Level. Consumers include many of their personal possessions in self-definition. These products can include jewelry, cars, clothing, and so on. The saying, “You are what you wear,” reflects the belief that one’s things are a part of one’s identity. 2. Family Level. This part of the extended self includes a consumer’s residence and the furnishings in it. We can think of the house as a symbolic body for the family, and the place where we live often is a central aspect of who we are. In addition, our children often reflect upon our self-worth; a big driver for parents to splurge on fancy clothing, tutors, and even etiquette classes for their little darlings. 4. Group Level. We regard our attachments to key social groups as a part of the self. 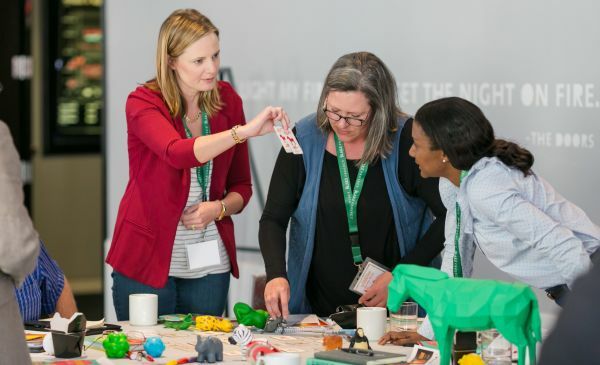 These links are responsible for big chunks of our identities, whether they’re based upon political affiliation, religion, athletic teams, or perhaps a love for one’s alma mater. There’s no doubt about it: We buy a huge range of products because of a drive to enhance the extended self. Athletic wear merchandisers get this, but companies in other verticals may not. Brands that link the consumer to key elements of the self, whether these are schools, favorite musical artists, old neighborhoods, or coveted identities like “successful executive” or “glam girl” have a leg up over others that don’t such a good job connecting to the extended self concept. Contributed to Branding Strategy Insider by: Michael Solomon. Excerpted and adapted from his book “Marketers, Tear Down These Walls!.” iBooks.